No, we don’t have those birds here (although since quite a few years kestrels have their nest in our barn). You might have noticed that this year we are expecting quite a few progenies of BFG Steinadler (the german name for golden eagle). After a female calf from Lykke Sirius daughter Herta Pp the next one followed: a bullcalf from Lamhoy Supery daughter Berit ( he is a full brother to Juliska PP in the picture) and another daughter from Boszena (S: Poldau). Since I was rooting for the Icelandic soccer team EM and said next calf would get an Icelandic name they should be named Gullörnson and Gullörndottir. But since that’s just too much of a tongue twister, we’ll stick to something easier. Next in row is Franziska Pp* (she’s pregnant with GS Lazarus PP*) and in autumn Elektra (Curaheen Vio) and Charolais cow Cassiopeia (Relax PP*) will close the saison. 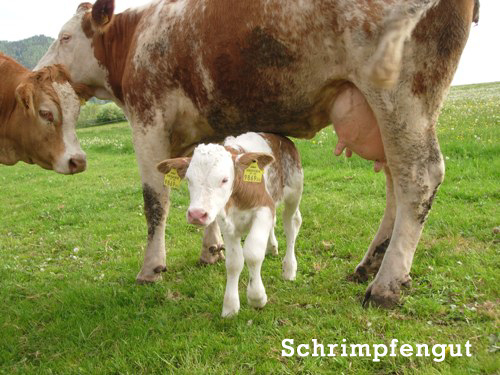 For those of you who are also interested in the dual purpose Fleckvieh: We had three calves of Incredible PP* – a male one out of a Waldbrand daughter and a twin pair out of a Hupsol. Easy calving (rather small at birth – not only the twins, but also the bullcalf) but they are growing nicely and seem to have a good character. We’ll test the female calf for Freemartin (this cow already had a fertil daughter of a twin pair – keeping my finger’s crossed. I was acutally hoping for a heifercalf as addition to the suckler cow herd).